SIMI VALLEY, California – United States Secretary of State Mike Pompeo addressed some of the most powerful members of Iran’s expatriate community on Sunday at the Ronald Reagan Presidential Library in Simi Valley, California, during which he said, “Iranians should not have to flee their homeland to find a better life” and countered the “fake news” narrative of Iran’s regime. Sen. Tom Cotton (R-AR) introduced Pompeo to the crowd of approximately 1,000 Iranian Americans and Americans. “When Mike Pompeo stands with you, you will never stand alone,” Cotton said, after noting that during his travels with America’s top diplomat, the duo became aware of secret side deals the previous administration had been conducting with the Iranian regime. Pompeo stated that subsidies provided to the regime’s cronies have provided the average Hezbollah combatant with roughly two to three times the monthly salary of what the average firefighter makes in Iran today. Thousands of Iranians have taken to the streets of Iran, particularly in cities outside of the nation’s capital city, to protest against inflation. Shouts of “Death to the dictator!” and “Death to Rouhani” were prominent throughout at least eight cities where protests took place against the regime. Pompeo noted on Sunday that Seddiq Ardeshir Larijani, the head of Iran’s Judiciary, has a net worth of $300 million dollars “from embezzling public funds into his bank account.” The Trump administration sactioned Larijani in January for human rights abuses and corruption. Pompeo also noted that Iran’s Supreme Leader Ayatollah Ali Khamenei has his own personal, off-the-books hedge fund called the Setad, which is worth $95 billion dollars. “Call me crazy, but I’m a little skeptical that a thieving thug under international sanctions is the right man to be Iran’s highest-ranking judicial official,” Pompeo said. 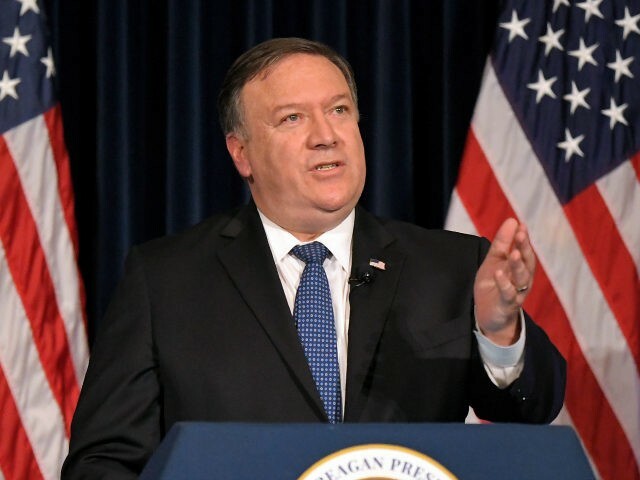 During his speech, Pompeo also mentioned the oppression against members of Iran’s Arab population, namely the Ahwazis. Pompeo also mentioned the reimposition of sanctions on Iran and the November 4 deadline by which all nations must stop importing Iranian oil. The November deadline is likely symbolic. From November 4, 1979, to January 20, 1981, 51 American diplomats were held hostage for 444 days in what became known as the Iranian hostage crisis. He highlighted three Iranian Americans who have made an impact on their society–namely, Goli Ameri, who has served at the State Department and the U.N.; Susan Azizzadeh, who heads the Iranian American Jewish Federation; and Makan Delrahim, who currently serves as the assistant attorney general at the Department of Justice (DOJ). In closing, Pompeo quoted President Ronald Reagan during his Westminster address.